Your #1 Source for Audio, Video and Speaker Building Components. 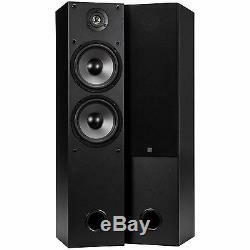 Dayton Audio T652 Dual 6-1/2 2-Way Tower Speaker Pair. Dayton Audio brings the high-value design formula of the B652 speakers to a tower form factor in the T652 floor-standing tower speakers. Dual 6-1/2" woofers and a 5/8" polycarbonate ferrofluid-cooled dome tweeter deliver sound with power, clarity, and bass punch. The bass reflex tower cabinet provides a firm bass foundation to 45 Hz, for rich, satisfying low end that complements any type of music or home theater content. The larger tower design of the T652 provides enough output to fill the largest listening spaces, while not overwhelming the d&###xE9;cor in more intimate settings. Additional features of the T652 tower speakers include non-marking rubber feet, spring loaded speaker terminals, and an elegant black ebony pica vinyl finish with removable fabric speaker grills. While most tower speakers are priced individually, for this great price you get a pair of speakers, plus everything you need to start enjoying them right away, including the speaker wire. Just supply your amplifier or stereo receiver and a quality music source. 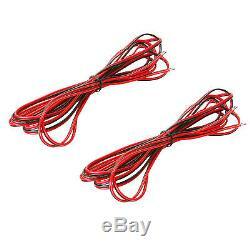 Note: Compatible and can be used with most receivers rated from 4 to 8 ohms. CE Pro review - Affordable Floorstanding Speakers from Dayton Audio. Dual 6-1/2 woofers provide superb bass power and punch. 5/8 polycarbonate dome tweeter with ferrofluid cooling. Slim-profile tower cabinet won't overwhelm your room. Please note: eChecks will delay your order. We will not begin processing your order until the funds have cleared. ECheck payments take longer to clear and will result in longer processing time. We will not be responsible for incidental or consequential damage due to defective or improper use of products. The foregoing shall be the exclusive remedy for defective or nonconforming merchandise. Damaged Merchandise - Carriers will not permit claims after 5 days. We will file a Damage Inspection Claim which results in a carrier follow-up to inspect your package. Carrier requires recipient to retain all boxes, labels, and packing materials until the claim has been approved. Please follow the Return Terms and Conditions before returning products. Write the RA# clearly on the outside of the outer carton. And printed material booklets, manuals, instructions, etc. Package the product to protect it from damage in route to Parts Express. Insure the package for the value of the product. Insufficient packaging may be cause for some carriers to deny damage claims. Books/CD's/Software (once seal is broken). Custom cut cable/wire, carpet, grill cloth, and tubing. Products with visible signs of use such as mounting marks, scratches, solder, sealing caulk, dirt, sawdust or other debris/residue, extreme odors such as cigarette smoke. Distinct burn odor and/or discolored/black spider around base of cone are characteristic of a burned voice coil. We will return at the customer's expense or destroy/discard after 60 days. Each speaker order includes the following instructions: To "audition" a speaker without scratching or marking it will require getting into the speaker cabinet and listening to it play without actually mounting it with screws. This can be done by tilting the cabinet back and setting the speaker in place. If the cabinet has bare wire leads, just wrap them around the solder lug connector on the back of the speaker to make the electrical connections. A friend can help hold the speaker in place while you listen to the new speaker. This is, of course, not an optimal way to listen to a speaker, but will give you the opportunity to identify major response problems or poor tonal characteristics prior to mounting. FEEDBACK We are committed to your satisfaction. We want you to be happy with your order. Please let us know if you are not satisfied before leaving feedback so we can resolve the issue. Thank you for your business and we are happy to serve you as our valued customer. Talent VB1 Folding Portable Vocal Booth. Stahl Tools SSVT Variable Temperature Soldering Station 374-100. Aura AST-2B-4 Pro Bass Shaker Home Theater Subwoofer. Dayton Audio IO525W 5-1/4 2-Way Indoor/Outdoor Speaker Pair. Be the first to hear about new and exciting products, special pricing and incredible deals! This listing is currently undergoing maintenance, we apologise for any inconvenience caused. 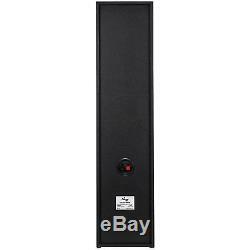 The item "Dayton Audio T652 Dual 6-1/2 2-Way Tower Speaker Pair" is in sale since Monday, August 25, 2014. This item is in the category "Consumer Electronics\TV, Video & Home Audio\Home Audio\Home Speakers & Subwoofers".partsexpress" and is located in 45066.